A good friend of mine loved Stevens Point Brewing's Cascade Pale Ale. Since the beer is no longer made, I tried to get the recipe from the brewery itself but failed. Based on the available data, I knew it had three malts in it: 2-row Pale, Munich, and Crystal. I made a version 1.0, but was very disappointed with it. Compared with the original, it lacked much of the flavor and aroma of the Cascade hop. It was darker, and lacked the sweetness of the original beer. In short, it wasn't even in the ballpark. Time to go back to the drawing board. Version 2.0 research had me searching various online forums for award-winning pale ale recipes by homebrewers. Specifically, I wanted to try to find a recipe that used only Pale, Munch, and Crystal malts and came out in the color and alcohol ballpark of the Stevens Point beer. I found a Lara Pale Ale recipe that used Goldings, Fuggle, Amarillo, and Cascade hops. I scaled that recipe down from 23 gallons to 5.6 (which in my system works out to ~5.0 gallons in the fermenter). This left me with a pale ale recipe that used four hops varieties, where the Stevens Point beer used only one. I fiddled around a bit to mimic the pattern and percentage of hops additions from the original recipe, replacing the other hops varieties with Cascade. My thinking was that this would deliver the right mix of bitterness, flavor, and aroma. The plan for the mash is a 90-minute mash, with two steps. One at 153F to convert most of the starch to small sugar that will be easy for the yeast to consume, and one at 156F to yield some unfermentable sugar to sweeten the beer and add body. 4.25 gallons were added to the kettle and treated with a Campden Tablet to remove chlorine and chloramine from the tap water. An additional 3.25 gallons were added to my sparge water kettle and also treated with part of a Campden Tablet. The Grainfather was heated to 153F and the mode switch changed to "Mash". The grains were crushed, mixed, and gently stirred into the kettle. The first 60 minutes of mash time were spent at 153F. The last 30 minutes at 156F. The wort was heated to 168F for mash-out. The grain basket was lifted from the kettle and locked into position. When it was mostly drained, the sparge water was added to the grain basket. As the grain was draining and sparging, the kettle temperature was set to 200F to make it quicker to get to a boil later. The pre-boil volume was planned to be 6.6 gallons and pre-boil gravity expected to be 12.9 Brix. Actual pre-boil volume was around 6.3 gallons at a gravity of 11.2 Brix. I chose to do a 90-minute boil here. For the first 30 minutes, no hops were added, to allow proteins to coagulate and fall out of the beer. At the end of the boil, the cold water side of the counter flow chiller was started to cool the chiller. 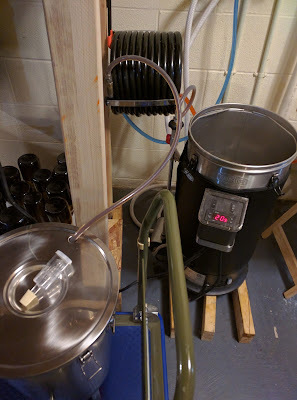 When the water running out of the chiller was cool, The Grainfather pump was started to begin transferring the cooled wort into a sanitized fermenter. Wort reached the fermenter at approximately 76F. This was good enough for the yeast, so I pitched the dry yeast and White Labs Clarity Ferm and stirred well. 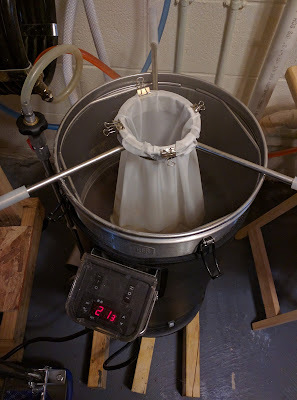 Then I moved the fermenter to my insulated chamber, attached my Cool Zone cooling jacket, and set the temperature controller to get the beer down to 68F and keep it within a degree above or below that. Final fermenter volume was 4.5 gallons at 14.5 Brix. That's a bit higher than the 13.1 Brix I estimated, but about a half gallon lower in volume, too. The beer will spend 7 days in primary fermentation at 68F. Cooling would be used to keep the beer within 1 degree of that temperature. Since the ambient temperature in the area is 65-68F, no heating will be used. After 7 says, the beer will be racked to a secondary fermenter and held at 68F for 3 days. After that, a sanitized bag of hops pellets with a stainless steel weight inside will be added to the fermenter. The beer will then be moved to a mini-fridge and controls set to keep it at 40F for 4 days. This should clarify the beer and the dry hopping should add aroma. The beer will be removed from the mini-fridge the night before bottling and allowed to warm up to room temperature. Water and 5 ounces of priming sugar will be boiled, then added to the bottling bucket. Since this beer will spend days at refrigerator temperatures, it may need fresh yeast to carbonate fully. Additional water will be boiled and cooled, to rehydrate champagne yeast to be used for carbonation. I use champagne yeast because it's inexpensive, adds no flavor, and is a strong fermenter. The beer will then be transferred from the secondary fermenter onto the sugar in the bottling bucket and gently stirred to mix it up. The rehydrated yeast will also be added during this stir. Bottles will spend a week in a cooler with a seedling mat heater which keeps the interior temperature at a cozy 76F. This helps the yeast to condition the beer quickly and fully. We won't know for a while if I achieved any of these goals. Hops bitterness is stronger, but less harsh than v1.0. It might even be slightly more bitter than the Stevens Point beer. The malt backdrop is a little sweeter, but still not where the Stevens Point beer is. I can't compare the clarity and color yet, as the beer is still undergoing conditioning. After I put a bottle in the fridge for a couple of weeks I should have a better idea of that. Change the mash to 30 minutes at 153F and 60 at 156F to generate more unfermentable sugars and sweeten the beer. Increase the amount of Munich and/or Caramel malt to sweeten it more. Use gelatin finings to clarify the beer. My version 1.0 recipe was not a good pale ale. It had an unpleasant, almost chemical-like bitterness and no real hops flavor to complement the bitterness. It was also very dry. This made it nothing at all like the real Stevens Point Cascade Pale Ale. The new version has a better hops flavor, lacking the harshness of the 1.0 recipe and increases sweetness slightly. I'm hopeful that I can do a version 2.1 that gets even closer. The beer has completed conditioning and made its way out into the world. A co-worker who is a big pale ale fan said that he'd rate it a 9 out of 10. Others who tried it and liked pale ales in general, also seemed to like this one. Although I'm not a pale ale fan myself, generally, I've actually enjoyed this one. Between White Labs Clarity Ferm and weeks in a refrigerator, version 2.0 is a very clear beer. There is definitely some chill haze there, however. If you leave a glass sitting out long enough and compare it to fresh, cold pour, the warmer beer is visibly clearer. Compared with the real Stevens Point beer, this version needs a little bit more hops bitterness. It's also still a couple of shades darker than the real beer. In the next version, I plan to use Pilsner malt and possibly dial back the Munich malt slightly. Increasing the mash temp at the end of the mash made a big difference in sweetness, too. It's maybe a little sweeter than the real beer. Dialing back the Munich will probably help some with that. Still, all things considered, this version turned out a massive amount better than v1.0. It's still not quite where it needs to be to become a true clone of Stevens Point, but this version is much closer than the first. People who have tried this version generally like it or love it. The following recipe comes from MadTree Brewing directly, so it should be close to the original beer. MadTree doesn't specify which yeast they used, so choose a variety that is appropriate to an American Stout or American Ale and you should be fine. MadTree didn't specify the mash temperature for the recipe. I'm guessing a common mash temperature of 154F and mash time of 60-90 minutes. Mash all the grains except for the Acidulated Malt for 30-60 minutes until conversion completes. Add the Acidulated Malt and mash for 30 more minutes. Mash out at 167F and then sparge with enough grain to meet your pre-boil volume based on your equipment's boil-off amount. Before bottling, add the Lactic Acid and enough priming sugar to reach your desired carbonation level for the beer, then bottle and condition until carbonated. 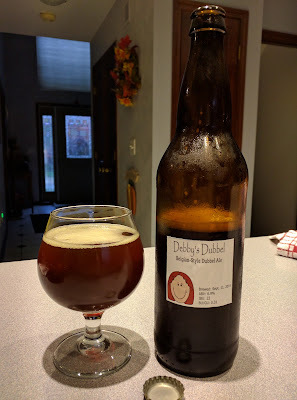 I've only made one Belgian Dubbel in all the time I've been brewing. That was an extract-based Dubbel that turned out just "OK" by my taste. I decided to create a new all-grain one. Some of you may be wondering why there's Melanoidin and Cara-Pils malt in the recipe. The short answer for this is that I've had trouble with some of my Belgian style beers getting a decent head of foam on them after they're poured. These two malts contribute to head generation and retention. I also dropped 3-4 pellets of Northern Brewer hops in with the Styrian Goldings for the same reason. High alpha acid hops can contribute to foam generation and retention. My hope is that this combination will result in a beer that has a nice Trappist-style head on it when poured. 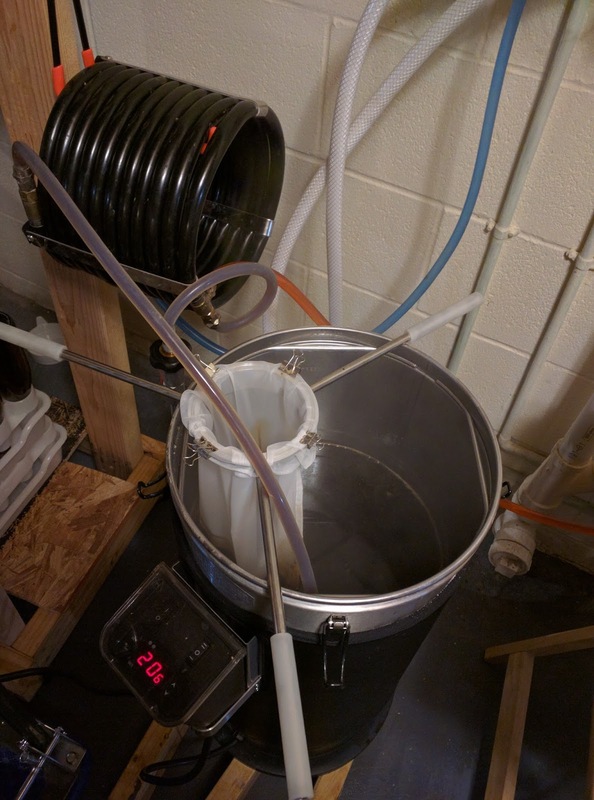 Put 5.25 gallons of water into The Grainfather and added a Campden tablet to remove chlorine and chloramines. My tap water is not far off from typical Belgian water, so no other adjustments were made. This water was heated to 140F. Grains added to kettle and a tablespoon of pH 5.2 Stabilizer added. Mashed grain at 140F for 30 minutes, then increased the mash temperature to 160F. Mashed grain 45 minutes at 160F. While doing this, heated 2 gallons of sparge water to 170F. As the grain mashed, a lot of foam was generated on top of the grain basket. It very nearly reached the lid of The Grainfather. Raised temperature to 168F for mash-out and held it there for 10 minutes before removing grain basket for sparging. When grain basket seemed mostly drained, sparged with 2 gallons of water. This recipe used a 90-minute boil. Added the Golden Candi Syrup as the wort heated to boiling since I was low on D-90 and I hoped that might darken it a bit. 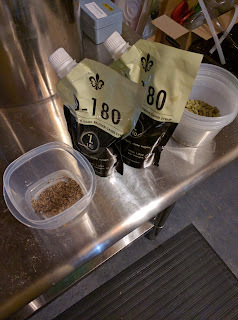 At 60 minutes, added Styrian Goldings hops pellets, plus 3-4 pellets of Northern Brewer at 10.1%. The Northern Brewer was added to incorporate some high-alpha hops in the beer for head retention. At around 30 minutes, cleaned and sanitized my fermenter and airlock so they were ready to use. At 15 minutes, added the Yeast Nutrient. At 10 minutes, added the D-90 syrup. At 7 minutes, began recirculating wort through the wort chiller to sterilize it. At 5 minutes, added the Saaz pellets and Whirlfloc. At 0 minutes, started a whirlpool in the kettle and began pumping wort through the counter flow chiller into the fermenter. Wort entered the fermenter at approximately 83F. This was too hot for the yeast, so I wrapped my fermentation chiller around it and lowered it to 70F before pitching the yeast. After pitching the Omega Labs yeast, I left the fermenter alone for over 24 hours. There didn't appear to be any fermentation going on. There was no airlock activity and the wort temperature had dropped to room temperature. I pitched a packet of T-58 Belgian Abbaye yeast to ensure the beer fermented. The next day the temperature had jumped to around 10F above ambient and there was airlock activity. The beer will spend two weeks in the primary fermenter with no temperature control. This allows the yeast to get as warm as it likes, hopefully generating more esters and phenols in the process. Primary fermentation should be over on approximately September 30, 2016. After approximately two weeks in primary, I will move the fermenter into a mini-fridge with a temperature controller and keep the beer at 40F for two additional weeks of conditioning. I removed the beer from the refrigerator and tested its final gravity. Final gravity was 10.5 Brix (unadjusted for alcohol). The original gravity of 1.074 combined with the final gravity and adjustment for alcohol by BeerSmith returned an ABV of 6.9%. I added 5.25 ounces of priming sugar and rehydrated champagne yeast to carbonate the beer. It was bottled in a variety of 12-ounce and 22-ounce bottles. These were placed in an insulated chamber kept at 76F. A sample tasted at bottling time seemed good. It was just slightly sweet, had a hint of plum, and a hint of roasted grain. I'm hopeful it'll turn out well. For the most part, this brew went off without a hitch. I ended up with a higher gravity than I expected, but I suspect this was due to not accurately measuring the amount of candi sugar used. I also had a slightly lower pre-boil volume than expected (6 gallons vs. 6.4). The biggest mistake I made this time around was not confirming that I had a full package of D-90 syrup before I started, and I think I lost track of how much Pilsner malt went in. I'd originally planned for 3.5 pounds but ended up losing my place while weighing the grain and used 3 pounds instead. The finished beer is a mahogany color with a reddish hue. I'd wanted the red color be more obvious, and it might have been if I'd had more D-90. The aroma is fruity and malty, hinting at sweetness. The beer itself is nicely balanced. There are hints of plum and roasted grain. Overall, it's an incredibly easy beer to drink and is nearly gone already. The candi sugar fruit notes aren't coming through like they should, probably because I didn't have enough to add. That's something I'll correct when I brew version 2.0. In the first two parts of this series, we covered recipe selection and adjustment, getting the ingredients ready, and performing the mash in The Grainfather. This week, we'll look at the boil. 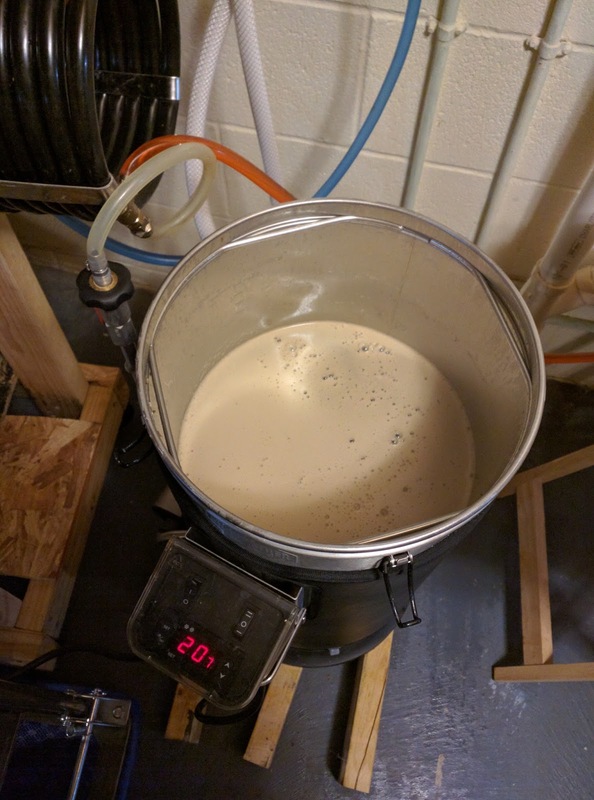 The Grainfather makes the boil process pretty simple. The kettle is deep enough that boil-over on a 5-gallon batch is unlikely. The thermal cut-out switch reduces the chances that you'll scorch the wort when adding sugars, syrups, or other ingredients. When we last saw our example beer, it was just starting to boil. When it finally reaches a boil, I take out my stainless steel spoon and stir the hot break foam back into the wort. Once the foam stops forming on top of the wort, I'll rig up my hop spider and place it in the kettle. I take two soapstone rocks and drop those in the bag to weigh it down. I use binder clips to ensure that the hop bag stays on the spider and doesn't drop into the kettle. As I mentioned in the first post, I have my hops already measured and laid out on the table. When it's time for each addition, I just dump the pellets from the plastic bowl into the bag in the hop spider. While hops pellets, large spices, and other items will go into the hop spider bag, Irish Moss and candi syrup go into the kettle directly. Near the end of the boil, the counter flow chiller (the large black coil you see below) must be sterilized inside to prevent contamination of the wort. To do this, you connect the chiller to the kettle's pump and drop the "wort out" line into the kettle. The boiling wort sterilizes the inside of the counter flow chiller as it flows through. When the boil is over, the pump is switched off. The "wort out"line is moved into the fermenter. The cold water line is turned on to run cold water through the wort chiller. After a couple of minutes to cool down the wort chiller, the pump is switched back on. Now wort is flowing into the fermenter. In my experience, the wort going into the fermenter typically enters it about 10-15 degrees Fahrenheit above the temperature of the tap water. So if your tap water is 57 degrees, the wort will be more like 67-70F going into the fermenter. During the summer, when tap water is more like 65F, wort will tend to go into the fermenter at 80-83F. This concludes the boil stage. Next week, we'll talk about fermentation.